There are some fictional events that I think are irresistible to filmmakers, simply because there’s a million and one ways to tell that story, and you can tell it so personally and make it so your own. There’s the “end of the world” scenario, where it can either be a personal apocalypse or something troubling on a theological level. It all depends on what the passions of that storyteller are, what drives them. And then there’s the “first contact with aliens” scenario, which has all the wiggle room in the world available to tell a story as rooted in optimism as Close Encounters of the Third Kind, or as capitalistically cynical as Independence Day. Denis Villeneuve’s Arrival has it both ways. It sees the opportunity and the meeting as an important meeting of the minds with fantastic implications for advancement for both species, but one with disaster looming in every moment, because humans are, by nature, a distrusting bunch. Arrival begins at what it tells us is the beginning. But chronologically, it’s not. As the story progresses, we begin to understand what Louise’s (Amy Adams) narration about the nature of time means. The beginning, the ending, whatever that means in any traditional sense, is meaningless. Louise is a linguistics professor at one of those nameless, generic College Town, USA universities where every classroom is set up as a massive lecture space with tiered seating pointing down to a single instructor. She comes to class one day to find it practically deserted, only a handful of students in attendance. Unbeknownst to her, something incredible has happened: An alien species has touched down on Earth in 12 different locations throughout the world. And that’s all anyone knows, until Colonel Weber (Forest Whitaker) recruits her for a translation job to initiate communication with the species, to find out why they’re here and what they want. She, along with Ian (Jeremy Renner), a scientist, must devise is a system to both teach our language to them, while cataloging what bits of language they give to us in return. Everything about our encounter with the alien species is so alien in a way that I’ve never really seen in a mainstream movie before. Instead of being some vaguely humanoid alien with a head, torso, and two legs, the visitors look like something we’ve never seen before. I would never dare describe them. Part of the thrill of the movie is seeing them for the first time. The alien ship, too, successfully looks like something that may feasibly exist from a world and a species we have absolutely nothing in common with. Gravity functions differently. Language is a complex code that the movie does a fantastic job of explaining visually. The first encounter we have with the aliens reminded me of something that H.P. Lovecraft may have written, where the mere idea of something existing beyond the stars is enough to drive someone mad, but to actually venture into the belly of the beast is where the real horror lay. Many people might not be able to handle it, which I thought was a nice, realistic touch. When Louise first arrives, her predecessor is being escorted out on a stretcher, unable to comprehend what he’s seen. The film does such a fantastic job of creating tension in those moments that I was wringing my hands endlessly. 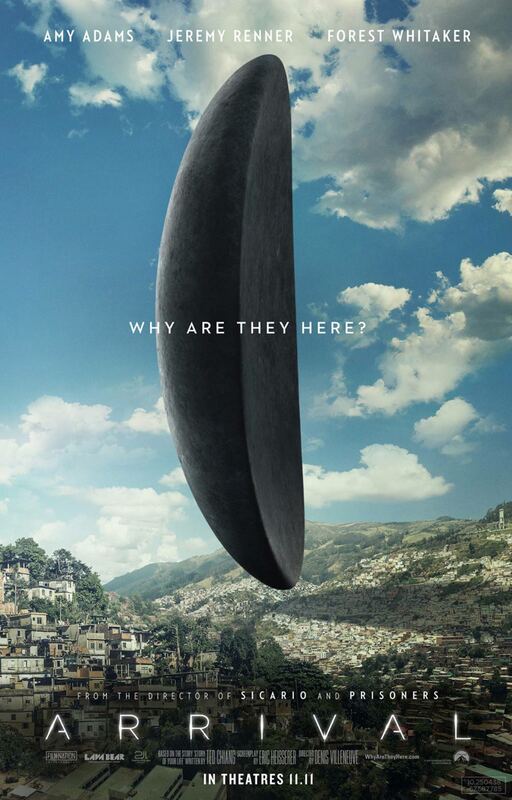 The screenplay, courtesy of Eric Heisserer, does a very good job at presenting complex ideas in ways that are simple enough that I could understand them, ideas like experiencing time in a 4th-dimensional sense, what it must feel like to have time be experienced non-linearly. It takes ideas like alien language and presents it in a way that sounds realistic, represented as a single symbol at a time that may represent incredible complexities, whole paragraphs worth of information. The real tension in the plot arises from something I fear might actually happen if this scenario were to go down in real life: Miscommunication. The governments and militaries responding to the arrival of the aliens are on high alert, expecting to be wiped out at a moment’s notice, so when presented with an opportunity to proactively retaliate, they practically relish the opportunity. Arrival is one of the year’s best movies by a long shot. I really, really enjoyed it. Denis Villeneuve is proving to be one of the best working directors today, and I hope that his treatment of a Blade Runner sequel continues his tradition of making some of the best mainstream movies today.